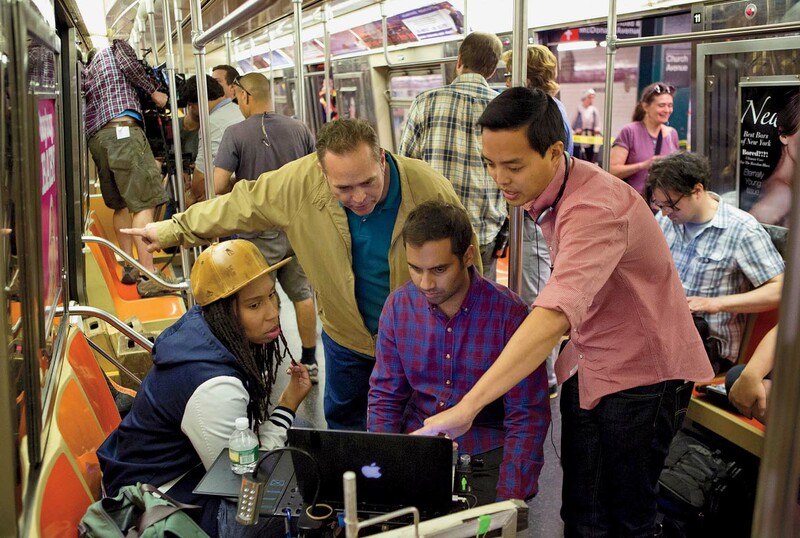 From right to left: co-creators Aziz Ansari and Yang on set in New York City with director of photography Mark Schwartzbard. —and career challenges (here pictured with his reality-TV producer-boss, played by Bobby Cannavale). In the television show Master of None, two Asian-American friends treat their parents to dinner. Awkwardly, one announces the purpose of the meal: “We wanted to learn more about you and how you got here.” But when prompted to share a story, his father is stoic: “I cannot think of anything noteworthy.” The son persists. “Come on—there’s got to be something, right? Like, well, what did you do when you were growing up in Taiwan?” “I worked very hard.” “Okay, did anything particularly interesting happen?” A long pause. “No.” Though the sons have some explicit takeaways from the encounter (“What an insane journey! My dad used to bathe in a river, and now he drives a car that talks to him!”), the episode’s deeper insight is conveyed by inference: how, without outward conflict or obvious angst, the children of immigrants become deracinated. A generational gap can become a feature of the landscape without anyone thinking to ask how or when it opened. The friendships formed in the red-brick stronghold on Bow Street provided a ready-made support system throughout Yang’s postgraduate un- and underemployment in Los Angeles: “That alone gives you the stamina to stay with it.” The time spent with his college band also came in handy during his first substantial staff writing job, on the NBC sitcom Parks and Recreation. Yang played bass guitar in the fictional band of a first-season guest star, “as basically an in-joke for the writers’ room”; by the sixth season, that character had been promoted to a series regular, and Yang got to share the stage with the likes of Wilco. Starting as Parks’s most junior writer, Yang learned the ropes of TV production over its seven-year lifespan. There, he also befriended the show’s most junior cast member, comedian Aziz Ansari, bonding over shared interests in nightlife and travel. 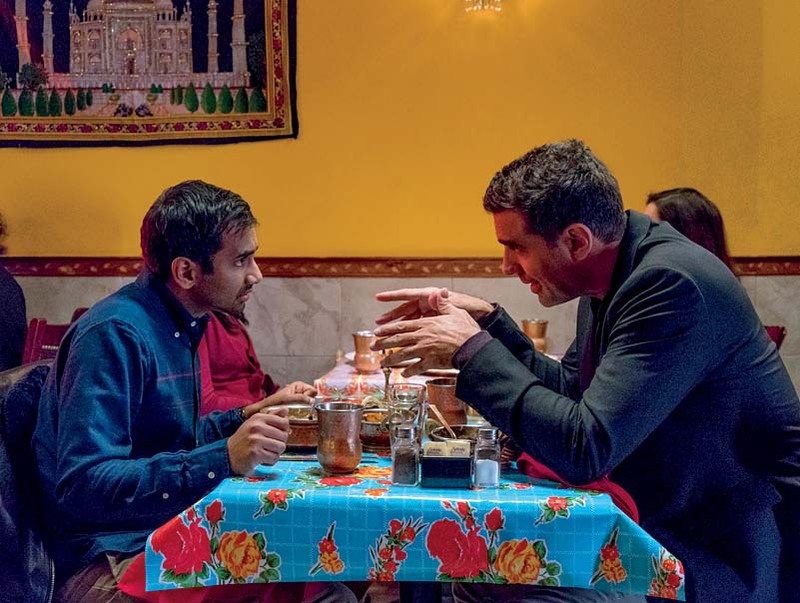 When Yang and Ansari struck out to co-create their own series (in which Ansari also stars), those enthusiasms were core to Master of None. Released by Netflix in 2015, it follows a young actor and foodie named Dev, living in New York with a plateauing career and a stalled relationship. 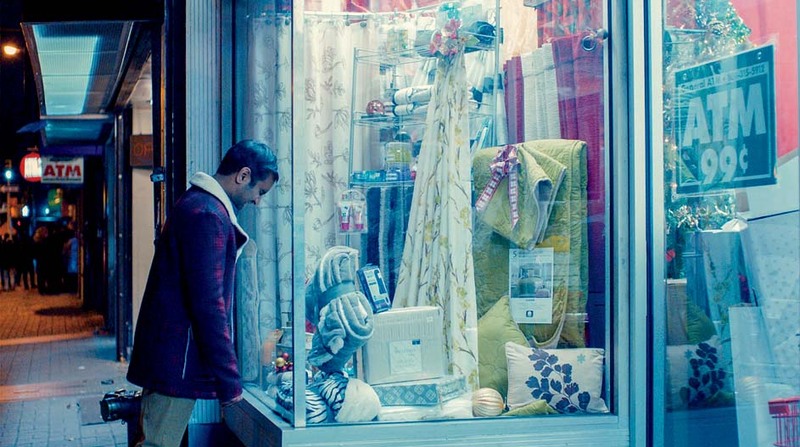 If the last generation of urbanite sitcoms were hangout shows, anchored at a bar or apartment and offering the cozy feeling of home, Master of None is a wandering show—a chatty city walk with no particular destination in mind, making pit stops at food trucks and restaurants. It’s stuffed more with incidents than plot turns—auditions for bit parts, weekend trips out of town, babysitting for friends—all cut with observational humor. Though some episodes home in on specific topics, like cultural stereotypes or sexism, the show is most concerned with the paradox of choice. Dev maintains an epicurean, cheerfully noncommittal existence—underwritten by material security (he’s dining out on a lucrative Go-Gurt commercial), nagged by a creeping existential itch. In one episode, he and his friend tucker themselves out trying to decide where to go get tacos. This relaxed, leisurely air, premised on a sense of abundance, seems emblematic of the television industry’s rapid expansion. In recent years, cable networks and online players have thrown money and creative control at promising writers. Such boom times have encouraged an exploratory, sometimes shaggy, approach to storytelling—especially on streaming-only platforms, where the series format has found new flexibility. For the new season of Master of None, this manifests as a kind of whimsy: one episode is a black-and-white riff on Italian neorealist cinema; another features the Jabbawockeez, a masked, silent hip-hop dance crew, who help judge a cupcake contest. Time, and the freedom to spend it, have been essential. The show’s looser production calendar allowed the writers to gather new experiences and to hone them into ideas—otherwise, claims Yang, the new season would have been all about publicity tours. 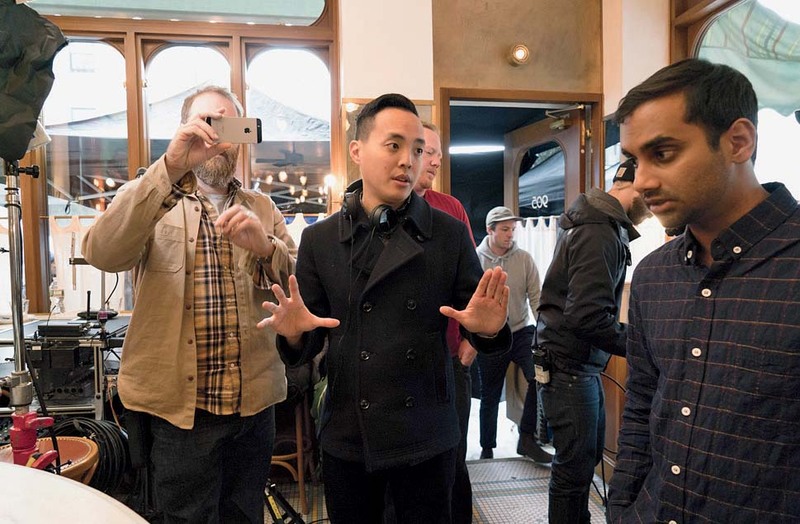 In the past, he’s described Master of None as a product of and about its makers’ “dying single years.” “Those single years are still continuing!” he says now, with a long, loud, burst of laughter.